This two-page handout gives a simple presentation of the basics for the practitioner. References from draft version of Pravin K. Trivedi and Murat K. Munkin, "Recent Developments in Cross section and Panel Count Models,"' January 27, 2009. Pravin Trivedi's website (Final version of "Recent Developments ..." will be posted there in April 2009). ISBN: 0 521 63567 5 paperback 432 pages. 1. A. Colin Cameron and Pravin K. Trivedi (1986), "Econometric Models Based on Count Data: Comparisons and Applications of Some Estimators and Tests", Journal of Applied Econometrics, January 1986, Vol. 1, pp. 29-54. 2. Shiferaw Gurmu and Pravin K. Trivedi (1994), "Recent Developments in Models of Event Counts: A Survey", Discussion Paper No.261, Thomas Jefferson Center, University of Virginia, Charlottesville. 3. Rainer Winkelmann (1994, 2000), Econometric Analysis of Count Data, Third edition, Berlin: Springer-Verlag. 4. Rainer Winkelmann and Klaus F. Zimmermann (1995), "Recent Developments in Count Data Modelling: Theory and Application", Journal of Economic Surveys, 9, 1-24. 5. A. Colin Cameron and Pravin K. Trivedi (1996), "Count Data Models for Financial Data", in G.S. Maddala and C.R. Rao ed., Handbook of Statistics, Vol. 14, Statistical Methods in Finance, 1996, pp. 363-392, North-Holland, Amsterdam. Most of these references focus on cross-section data. 7. Pravin K. Trivedi, Guest Editor, (1997), Special Issue: Econometric Models of Event Counts, Journal of Applied Econometrics, May-June 1997, Vol.12, No.2. 8. Christian Gourieroux and T. Magnac, Guest Editors (1997), Special Issue, Journal of Econometrics, August 1979, Vol. 79, No.2. Many regression packages now incorporate some count data components. These include the following, but note that this list is not exhaustive and packages are continually updated. Gauss: cross-section in the count module. Cross-section usually means Poisson, Poisson PML or QML, and negative binomial. Panel usually means fixed and random effects Poisson and negative binomial (from Hausman, Hall and Griliches 1984 Econometrica paper). Many applications require own code written in, for example, Gauss. For these see the original author, or journal web-sites which may have the code and data. 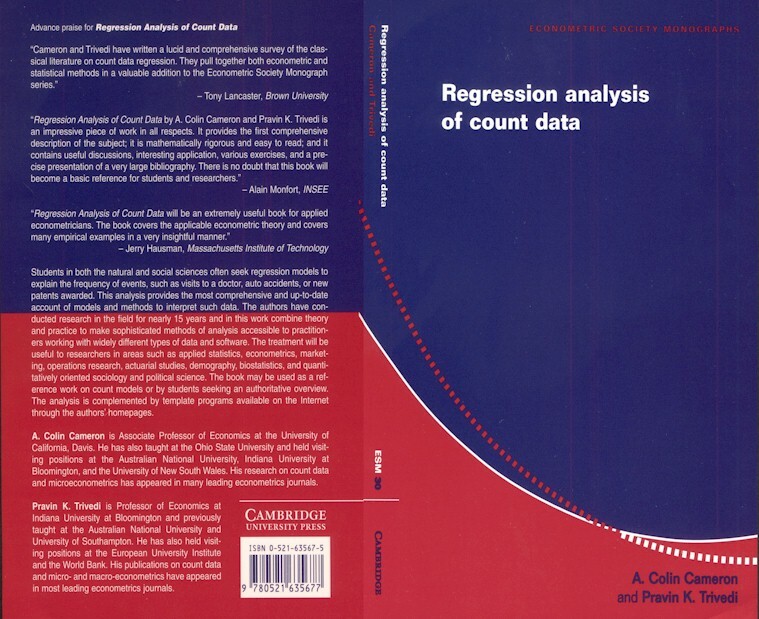 In addition see Data and programs for "Regression Analysis of Count Data"